Not only do we provide industrial chemicals we also offer the safest methods of use, with our barrel pumps and sprays to prevent spillages and liquid contact. Our staff are more than happy to help via phone call or email so feel free to get in contact anytime. Syphon pump to suit 15-25 litre drum or plastic containers. Polyethylene construction. Syphon..
Syphon pump to suit 15-25 litre drum or plastic containers. Polyethylene construction. Syphon drum p.. Economical, hand-held 1.5 litre pump-up sprayer with NBR seals. Natural polyethylene bottle with cal..
Embossed Mat250 Mats per case 510mm x 380mm High quality embossed bath mat for extra absorbency and .. Kills Norovirus, E. Coli, Swine Flu, HIV, Hepatitis C, MRSA & Clostridium difficile Passes EN 12..
As a release/antistick agent; used in plastic injection moulding, fibre glass moulding, footwea.. 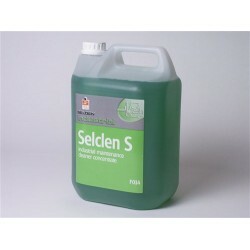 The ideal food plant cleaner sanitiser. Fully tested with proven effectiveness against Gram+ve and.. Maximum strength industrial maintenance cleaner concentrate A powerful alkaline degreaser for stubbo.. Powerful cleaning action removes the heaviest industrial soil. Cuts through grease, oil and grime - ..
Removes wax build-up from floors. Engine and Industrial plant cleaner. Removes tar and bitumen easil..
Selscale Acid Concrete Cleaner and DescalerRemoves cement and plaster splashes - ideal for init.. Heavy duty formula . Strong powerful action rapidly cuts through grime and dirt, strips polish from .. Powerful fast acting formula. Water soluble-simply wash off with water. Low viscosity ensures quick ..
New solvent blend which safely and effectively removes graffiti from plastic and polycarbonate surfa..